Get out of town with these interesting Las Vegas side-trips: Hoover Dam (in Boulder City), Valley of Fire State Park (in Overton) and Clark County Heritage Museum (in Henderson). 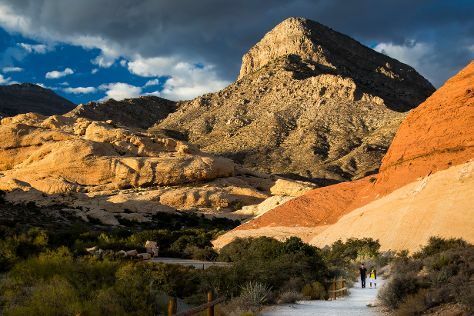 There's still lots to do: explore the stunning scenery at Red Rock Canyon National Conservation Area, admire the natural beauty at Bellagio Conservatory & Botanical Gardens, admire the local landmark of Bellagio Fountains, and shop like a local with The Strip. To see ratings, other places to visit, and tourist information, you can read our Las Vegas trip itinerary maker tool . If you are flying in from Canada, the closest major airports are McCarran International Airport and Laughlin Bullhead International Airport. In April in Las Vegas, expect temperatures between 31°C during the day and 16°C at night. Wrap up your sightseeing on the 12th (Fri) to allow time to travel back home.